Imagine beautiful twinkling candles suspended over your dining room table. There’s no risk of fire or mess and the romantic light is just as real as genuine candles. LED Chandeliers feature multiple elements, however, our favorites are those that take advantage of the LED’s ability to perfectly replace the candle. A simple upgrade means that every meal you eat at the table will be a candlelight experience! LED’s are perfect for illuminating your backyard and patio area. Their low cost makes them affordable to run all day while their durability ensures that you won’t be replacing light bulbs constantly. LED’s are easy to protect from the weather and elements, they also look great. We love them in classic wall pendants and tall post lights which add a touch of charm while remaining extremely practical. You can even place certain LEDs directly in your pool or pond, creating an amazing effect! LEDs are brighter than traditional lights, they’re also cheaper to run. That’s why our favorite place to feature them, in our home, is in a security flood light. Their bright light and cheap cost effective power use make them the perfect choice to keep your drive and walks illuminated. 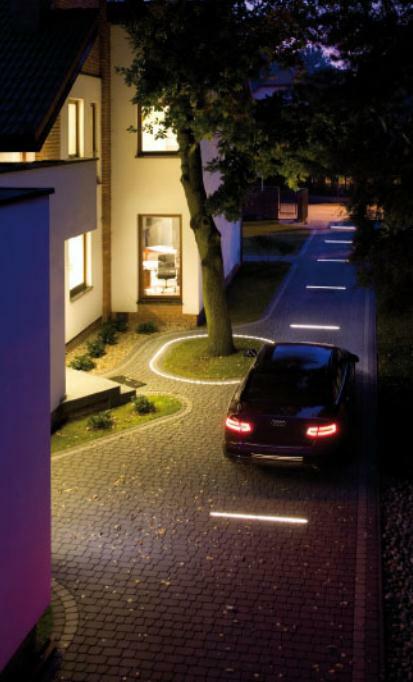 Since illuminated sidewalks and driveways increase visibility at night, they deter crime, pests, and provide light for you when you’re leaving or coming home during the night. Most flood lights run at a wattage lower than 65 watts — meaning you’ll save lots of money on your electric bill while keeping your family safe. No matter what you lighting needs are, LEDs make it a bright, affordable option for you. Check out all our other ideas to choose the right LED lights for your home.